Craving Garden Produce Mid-Winter? It's Easy, Fun and Delicious! Life without fresh produce and garden greens during the winter can be absolute torture. Luckily, we know about a way to grow fresh greens all winter-long right on your counter-top. The way is sprouting and growing garden vegetables as microgreens! Not only can you enjoy fresh produce throughout the winter this way, you consume higher concentrations of vitamins and minerals compared to their full grown counterparts (perfect for a healthy New Year's resolution, right?). 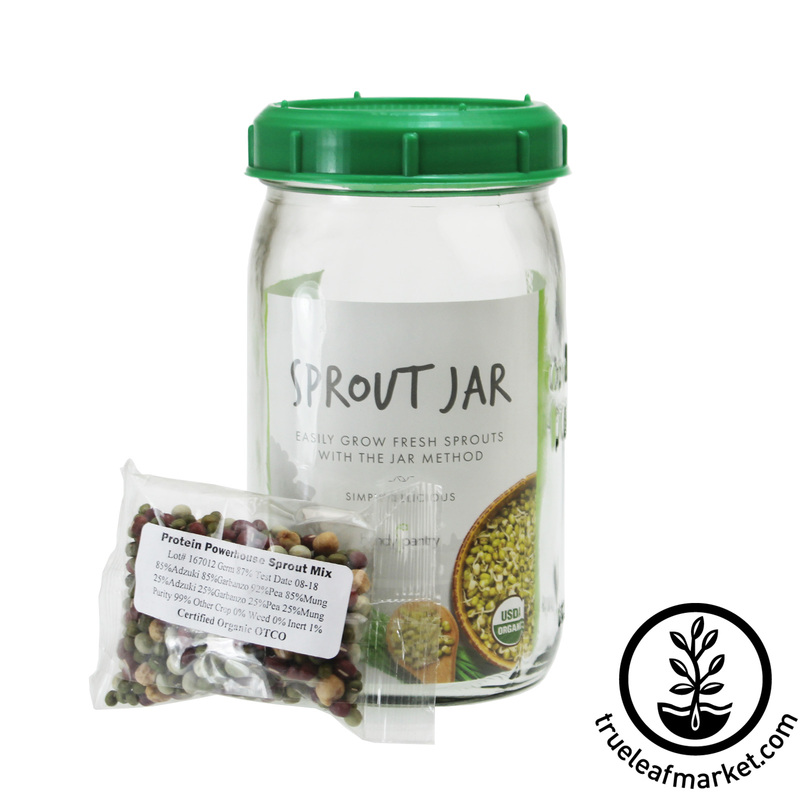 Within days you can have full-grown, tasty sprouts ready to eat. Most microgreens grow and mature startlingly fast so you can enjoy multiple micro crops throughout the cold months! All of this can be done right in your kitchen, garage, or other work space indoors. We understand if you think this is all too good to be true. But believe us, it’s not. Growing sprouts can be a year-round hobby since they are an indoor crop, providing one with an on-going "mini" produce garden right in your kitchen or growing space. 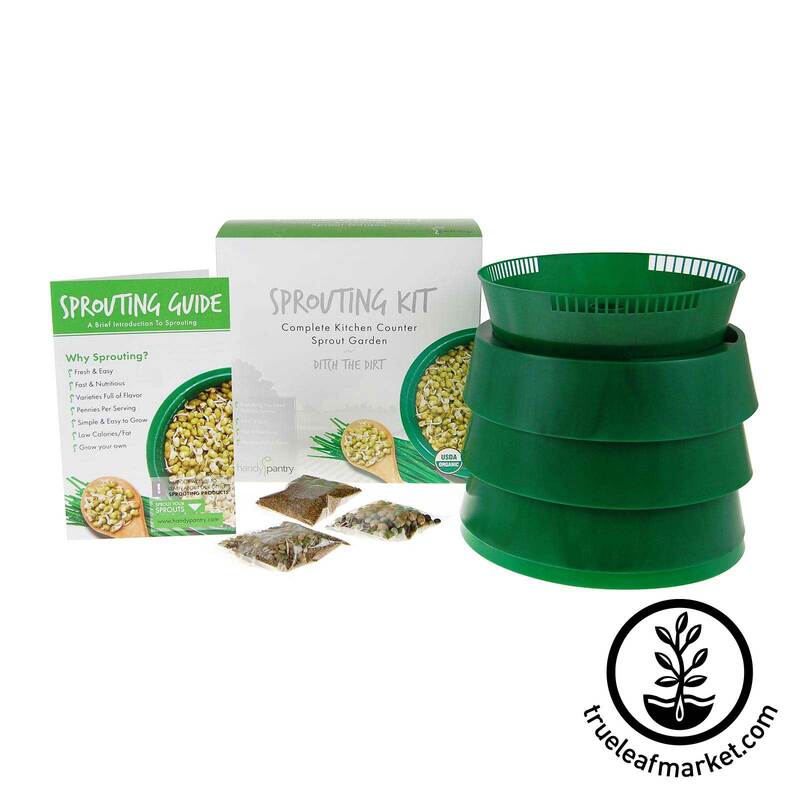 All you need are sprouting seeds and a sprouter! And don't worry! You are not limited to growing just alfalfa sprout like the ones you've seen in your grocery stores—although, we do love alfalfa sprouts! For more detailed instructions on sprouting, check out our stater guide page. We carry several heirloom and organic sprouting seed varieties that will surprise you with their quick growth and bold yet palatable flavors. Sprouted peas are an absolute favorite with its sweet taste and crunchy texture—it is especially great as an ingredient in our Protein Powerhouse Sprouting Seed Mix, which also includes Garbanzo, Mungbean, and Adzuki Bean. Also, try growing spicy Radish sprouts on their own or as a part of our 5-part Salad Mix, which includes Alfalfa, Green Lenitl, Broccoli, Mungbean. Pictured below are a few other varieties of sprouts we've grown; check out our website for a full list of sprouting seeds. 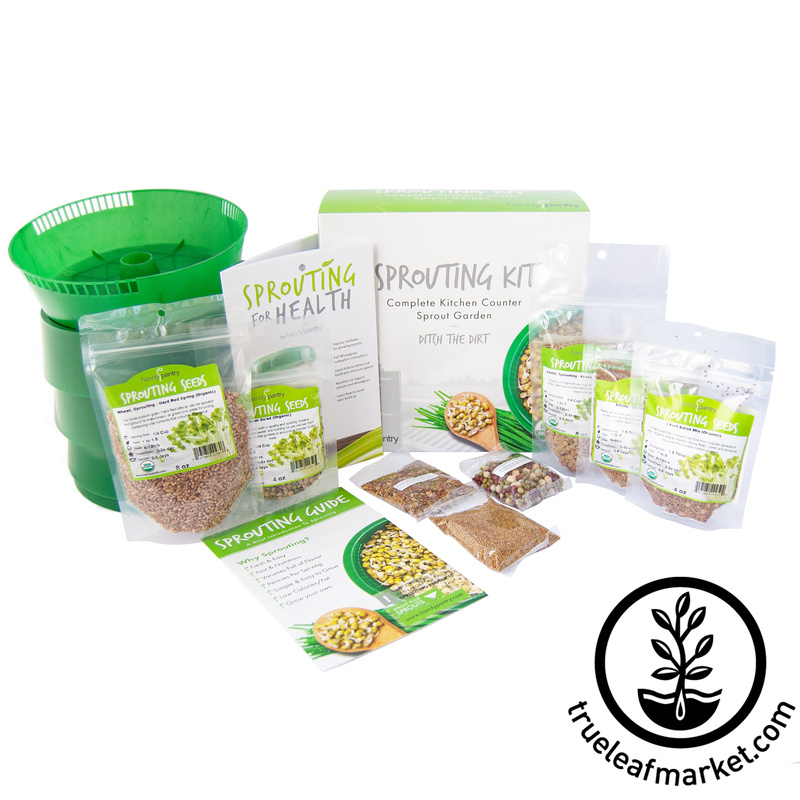 If you're looking to get all your supplies and start right away, check out some of our kits to get you started sprouting today! Nutritionally speaking, sprouts are a powerhouse. Sprouts contain a significant amount of protein and dietary fiber, Vitamins A, C, and K, folate, pantothenic acid, niacin, magnesium, zinc, and calcium. They have been said to improve digestion because of the high number of enzymes and work to prevent heart disease because of their high amounts of omega-3 fatty acids. Microgreens have a lot of these same nutritional benefits—also being high in enzymes, vitamins, minerals, and antioxidants—without compromising their bold flavors! As we’ve experimented growing microgreens, we’ve found that some microgreens excel during winter because in the summer or spring, they risk becoming too warm, resulting in them not taking root as easy, struggling to germ and failing. So, although you will be growing them indoors with even heat, the occasional cold draft will not affect your crop. Or if you decide to grow them next to a window, the cold air emanating from the glass shouldn’t affect the microgreens either. As long as your microgreen variety seeds are receiving adequate light and water, they will grow just fine. As you can see, we've tested most of our varieties microgreens and they turned out pretty stellar! 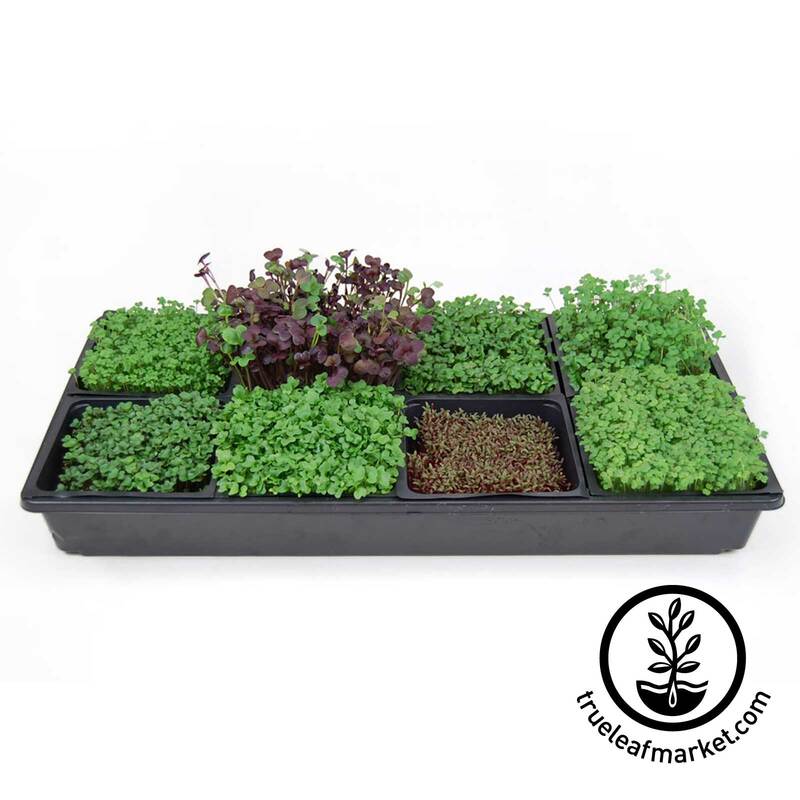 Pictured at the top of the article are six of our lettuce varieties after roughly three weeks of growth and pictured below are several microgreens that we've listed above. If you are unfamiliar with microgreens or need specific growing instructions, please visit our page our microgreens starter guide page. Microgreens have a wide variety of uses. Of course they are tiny versions of their full grown counterparts, but they pack a full-grown flavor! They work particularly well in a slaw with full-grown greens or with other microgreens. Pile them on a sandwich like sprouts, and you'll be blown away by the full flavor and the nice crunchy texture! 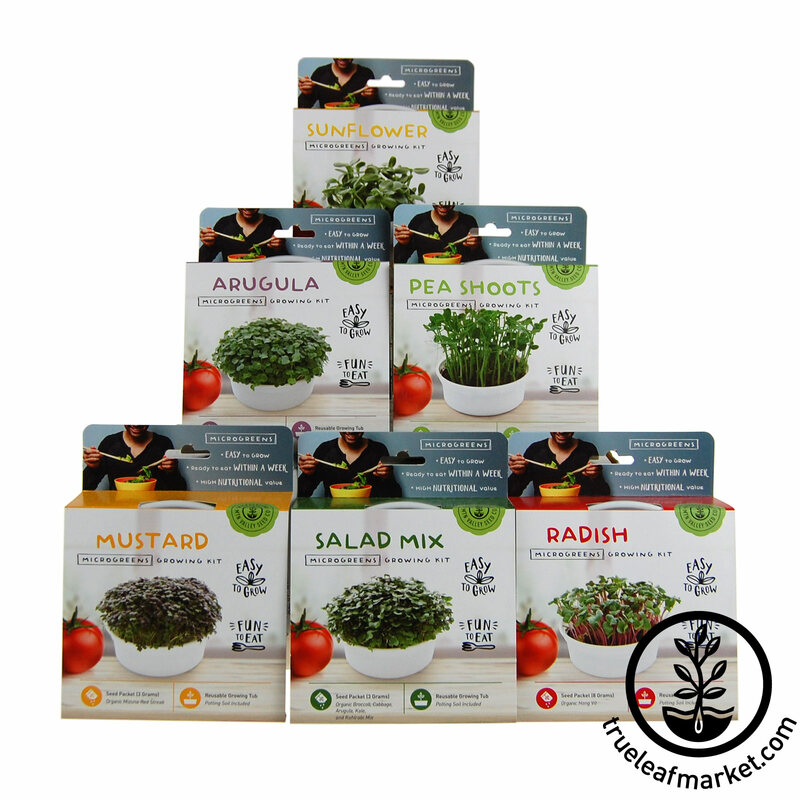 Below are a few of our Microgreens products that can help you in your own counter-top gardening ventures!